Best Chinese Knives: Extrema Ratio RAO Clone Tactical Knife Review! 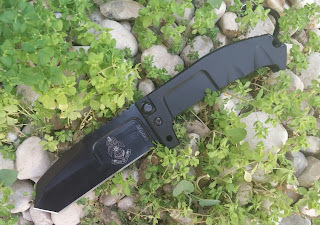 Extrema Ratio RAO Clone Tactical Knife Review! So, I've received this about a week ago and would like to do a short review of it. The knife came in an Extrema Ratio branded black cardboard box, including a nylon sheath and a pin for turning this into a fixed blade and to secure the blade in the closed position. It had few scratches and nicks on the aluminum handle (not a big deal, this knife is strictly a user), the fit is good, the finish not so much. No blade play in both directions and the blade came centered and sharp. The bang for the buck - the knife is truly impressive. I mean if you thought the Medford clone was huge - wait till you see this one, it makes the Praetorian look like a gentleman folder in comparison. It is made pretty well, despite the finish flaws, and has great materials for the price - unique locking system, aluminum handle, huge, thick slab of steel as a blade and even includes a sheath (which is essential, because this knife doesn't have a pocket clip (and is too big to carry in the pocket anyway)). Few words on the sheath - it seems cheaply made, but functions surprisingly well, doing it's job holding the knife in both open and closed positions. The knife is also pretty smooth to open and close. Definitely the charisma and the ER design - the knife screams "TACTICAL" with all of it's features, starting from the full blackout color, to the very deep aggressive gimping, the overall shape, the 185 RAO unit logo and markings and the molle compatible sheath. I wouldn't call it elegant looking knife, but a brutal, beastly attractive, massive blade. Another great thing to mention is the balance. Although the knife is pretty heavy (285.8g/10oz) it doesn't seem to feel as heavy in the hand, because of a good balance between the handle and the blade. The lock - from one side it is a unique lock (kind of a backlock, but with a thumb studs to lift the back spring instead of the lever. It holds the knife with no bladeplay, but has not so much meat on the blade to hold it (like in the Cold Steel knives). The added pin is more of a secure add-on than a lock, because it doesn't actually support the blade, but only prevents it from closing on the fingers. Another neutral thing is the fact that this is a 2 handed knife. I mean it can be opened one handed (by shaking the blade out) and also closed, but neither of these methods is comfortable. If you are using both hands - it becomes a pretty easy to use knife. The finish - as I've already mentioned - the knife had same finish flaws on the handle and the blade. The black coating on the blade seems to be just paint (very similar to the older Cold Steel black coating, which is shiny and comes off pretty easily). The steel is 440A, not a great one, but you can't expect much else in that price point. The pin came on a very cheap string and without the keyring (both easily fixable). The guy who will try to EDC this knife in his pockets. It is hugely impressive and attractive as a novelty item, not so much as a usable urban EDC blade. I mean it can still be used, but mainly as a cool outdoors knife, that you can use and abuse (mainly because of the cheap price). I think it is less intended for knife aficionados or the Nick Shabazzes (who will take a fixed blade to do those tasks), but more for guys who like Medford Knives for their brutality and undeniable charisma. Nevertheless, I'm very glad I got this one, as I do like ER designs and because of the many unique features it has.